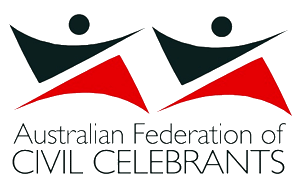 My name is Michaela Von der Borch and I am an Adelaide based marriage celebrant registered by the Federal Attorney-General’s Office. I believe it is important to trust and feel comfortable with the people around you on your special day, so let me tell you a little bit about me. I am married with two sons and a very spoilt golden retriever named Murphy. As well as my work as a celebrant I have worked in various positions in retail, most recently as a dispensary technician in a local hospital pharmacy for five years. This role has enabled me to work with people of all ages, backgrounds and cultures and has enhanced my communication skills and creativity while indulging my passion for helping people. In my free time I am actively involved in ballroom dancing, teaching a weekly class in modern ballroom and latin dancing, which has resulted in meeting many wonderful people and even helping some couples with their bridal dance. Being involved with the preparation for someone’s special day in any capacity is a wonderful honour, and as a wedding (and all occasion) celebrant I love knowing that I am helping to create memories that will be treasured forever. With that in mind, I take great pride in working with you to ensure that your ceremony is exactly what you envisage, and a true reflection of your relationship and personalities. I truly love what I do and I feel privileged to be a part of people's lives during their most important milestones. I would love to hear from you so please contact me to arrange an appointment to discuss your event. You may also like to check availability and book your ceremony directly.